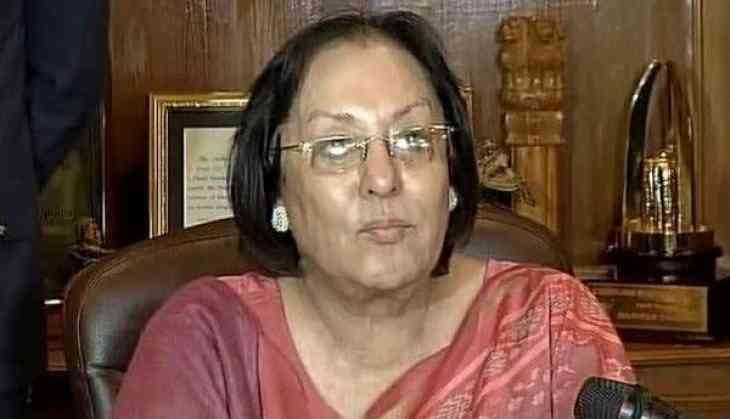 Manipur Governor Najma A Heptullah, has called for the immediate scrapping of triple talaq, saying that it is a medium of oppression. In an interview with Zee Regional Channel CEO Jagdish Chandra to be aired this week, Dr. Heptulla said, "Triple talaq should be scrapped immediately as it is only a medium of oppression. It is contradictory that we are living in the age of Facebook and Whatsapp and we are favouring a 1400-year-old ritual." She said only the Supreme Court can decide on this issue and not the All India Muslim Personal Law Board (AIMPLB), as it is only an NGO. She said she has struggled all her life for securing the rights of Muslim women and congratulated Muslim men for giving their women the freedom to vote freely in UP elections. Dr. Heptulla rejected a suggestion that she had approached BJP president Amit Shah to make her a candidate for president or vice president. She said that Prime Minister Modi will not waste this opportunity and this year's presidential election will send a message to the world. Dr. Heptulla said she met Modi for the first time in Gujarat when the devastating earthquake struck the state during Keshubhai Patel's tenure. She praised him for working at the grassroots level in all areas. She said it is very important to audit work rather than money. She said Prime Minister Modi echoes her thinking that people should not be seen between majority and minority, but only between rich and poor, adding that she is very impressed by Modi's mantra of "Sabka Saath Sabka Vikas". On the prevailing political situation in Manipur, Dr. Heptulla rejected the allegation that she had not invited the single largest party in Manipur. She said she had only worked in favour of a stable government and added that d her relationships were good with both incumbent Chief Minister N.Biren Singh and his predecessor. Okram Ibobi Singh. In Manipur, she said, backwardness and roads are the main issues. She was all praise for Transport Minister Nitin Gadkari for ordering the construction of a highway linking the north east and Myanmar to Thailand. She also stressed on the fact that world's highest bridge is also being built in Manipur. She said she is working to promote agriculture and organic farming in the state. She appreciated that there is no economic blockade or bomb blasts in the state now. Speaking on Kashmir, Dr. Heptulla said the situation is not as bad as is being made out by the media.